I’m a sucker for free shipping. In fact, that’s why there’s never any shipping charge for my own book. So, when I bought a bunch of Amazon titles for Christmas recently, it thrilled me to realize I could get a book for myself with free postage. I bought a long desired non-fiction volume: Willpower: Rediscovering the Greatest Human Strength by Roy Baumeister and John Tierney. But I really care about willpower because it’s integral to writing. I’d read about Baumeister’s groundbreaking work before. He’s director of the social psychology program at Florida State University. And John Tierney is a science columnist for the New York Times. Baumeister is the guy who discovered that willpower runs out as each day wears along. Each morning we awaken with the maximum amount of self-command we will ever have. We should all think of ourselves as similar to very large old-fashioned egg-timers, filled with sand. We wake up (turn over the egg-timer) and the willpower/sand starts to run through to the other side. In the case of willpower, however, it’s not gravity causing the drain. It’s decision-making. Each decision we make throughout the day, whether small — which route to take to work — or large — which employee to hire — depletes our willpower resources. Like oil, willpower eventually runs out. Every day! Baumeister calls this decision-making fatigue. If you’ve ever worked in sales, for example, you know not to ask clients to make big financial purchases at the end of the day. They’re too tired. In fact, Baumeister found that even judges suffer from this sort of fatigue. Prisoners who appear early in the morning receive parole about 70 percent of the time, while those who appear late in the day are paroled less than 10 percent of the time. Even when their backgrounds, charges and behaviours are similar. But here’s how Baumeister’s findings on willpower relate to writers at Christmas (or, for that matter, at any holiday — summer or statutory.) If you’re writing something big, such as a book or a thesis, you’re likely to want to stop working over the holidays. While I’m the last person in the world to tell you to never take a break, I urge you to be mindful about it. It takes a lot of work to build up the writing habit. Doing so involves willpower and decision-making and it tires you out. Once you’ve developed the habit, writing becomes more second-nature so it takes fewer of your resources. 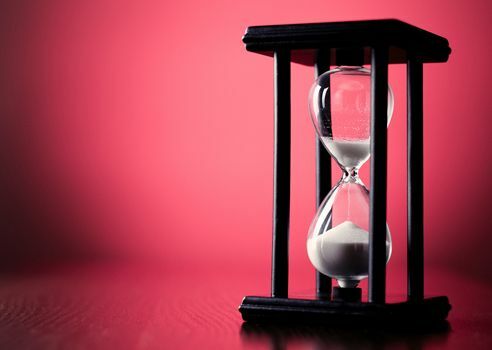 To return to the egg-timer metaphor, if you’re accustomed to writing x minutes per day, you can do it with less sand. Re-establishing the writing habit after Christmas, however, will require more sand/time. So, take your break but be aware that when you resume in January you’ll need more time to get started. If you have difficulty, start back from scratch: maybe writing for as few as five minutes per day. Once you’ve done that for two weeks then start increasing your time gradually. If you’re not working on a book or thesis, but your day job involves lots of writing, recognize that it will take you a while to get back in the swing of things after the holidays. Give yourself more time. And try to reserve mornings for writing, when you naturally have more willpower in reserve. As for me, I’m going to take an eight-day break from my blog, although I will be doing other writing every day except Dec. 25 and Jan. 1. This is the last entry you’ll see from me until Friday, January 2. Merry Christmas and happy new year to those who celebrate those holidays! See you in 2015. P.S. If you’re writing a book or thesis and want the benefit of increased accountability, consider my Get It Done program. New participants start on the first Monday of every month. How do you safeguard your willpower? We can all help each other so please share your thoughts with my readers and me, below. If you comment by December 31, 2014 I’ll put your name in a draw for a no-charge copy of the inspirational non-fiction book, The Writing Life by Annie Dillard. If you don’t see the comments section, click here and then scroll to the end.